This map highlights the outer reaches and inner realms of the study area subject to the multifocal lens of my data collection. The exterior investigation concentrated mainly on the Sydney City and Marrickville council areas. Of significant long-term interest were sites within the suburbs of Enmore, Newtown, Broadway, Surry Hills and Lewisham. 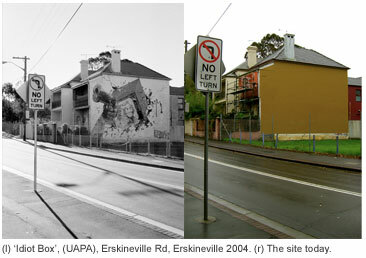 Over the last decade inner Sydney has undergone significant gentrification that has resulted in the loss of a number of graffiti sites of cultural significance, including Andrew Aiken's 'Idiot Box' mural on Erskineville Road (see over). A significant proportion of this district that was once primarily light industrial (warehouses, factories) have been converted into residential, commercial and retail zones. 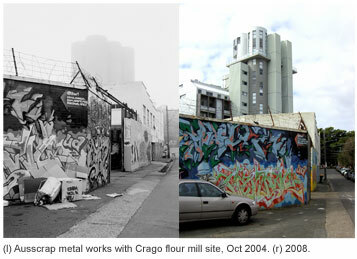 Built in 1896, the iconic Crago Flour Mill at the end of Gladstone St, Newtown provides a highly visible and much discussed instance of repurposing in the area (see over). The site is situated in an active area of illicit graffiti activity and sanctioned pieces which adorn the exterior of the Ausscrap metal factory directly across the road from the mill site. Urban renewal schemes of this nature have not only impacted on the local demographic but contributed to an ongoing tradition of illicit public discourse. Proclamations such as 'yuppie scum out' have become a recurrent feature of the built environment as local residents and members of the graffiti community scrawl out their opposition to yuppie infiltration in the area (see over). The more recent 'down with prams and designer babies' or 'respect the locals', positioned directly outside a café in Weekes Lane, Newtown makes its statement intentionally loud and clear. What may seem offensive to some is actually a statement of caring: what people care about isn't always beautification in the form gentrification or homogenisation; which in turn questions what constitutes urban regeneration (Dew 2007). Recent changes in council policy (zero tolerance) and heavy fines have seen the demise of self-approved works and the rise in privately or commercially sanctioned works, commissions and packaged public art events. 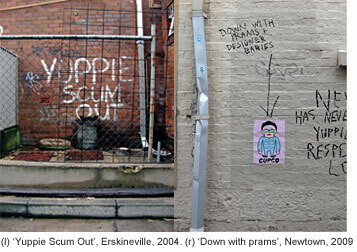 The Marrickville and City of Sydney Council have also put into place a number of public aerosol art programs and commissioned young aerosol artists to paint murals in an attempt to counter the illicit graffiti (mainly stencils and tags) in the area which largely serve an authorised and normative communicative agenda. Fortunately, in spite of 'zero tolerance' the graffiti writing and urban art subculture still persists. Artists and writers continue to find ways of getting their messages out there. Today, graffiti practitioners work within a range of self-approved, privately sanctioned as well as legal contexts, and with sponsors (such as Ironlak) sensitive to the cause often in the most surprising and unexpected places, such as dormant built interiors. As private property lies in wait for appropriation or conversion, artists and writers are taking advantage of the aesthetic potential and seclusion afforded by these sites to practice their craft removed from the fear of prosecution. Moreover, in the last five years there has been a rise in more rapid and spontaneous figurative works as graffiti and urban art continues to affirm its place as a highly adaptable, complex, contradictory, crafty, pervasive, transformative and opportunistic nature of this increasingly and hybridised cultural practice worthy of our attention.